So far, we've only gotten teases of the Indominus Rex, the genetically modified hybrid dinosaur at the heart of Jurassic World, from the park's viral website, the first trailer and the Super Bowl spot. 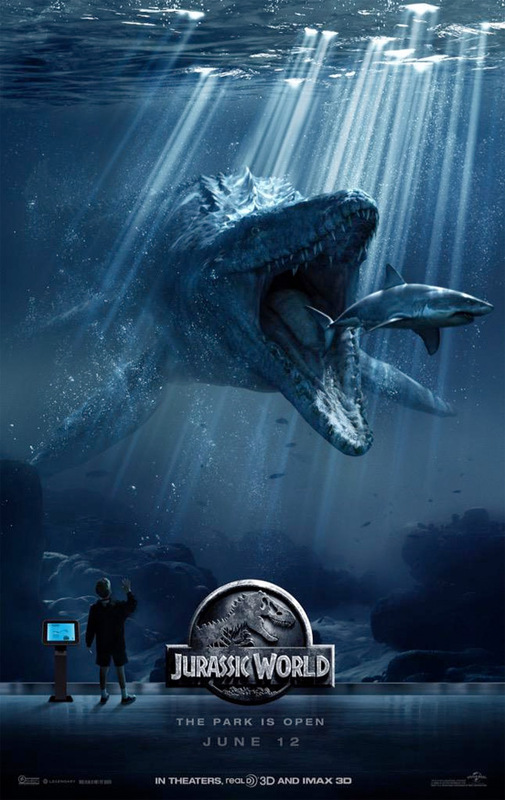 But soon we'll see even more from the latest installment of the Jurassic Park franchise as a brand new trailer for the sequel/reboot will arrive sometime on Monday, April 20th, the same day as the Batman v. Superman: Dawn of Justice IMAX trailer event. 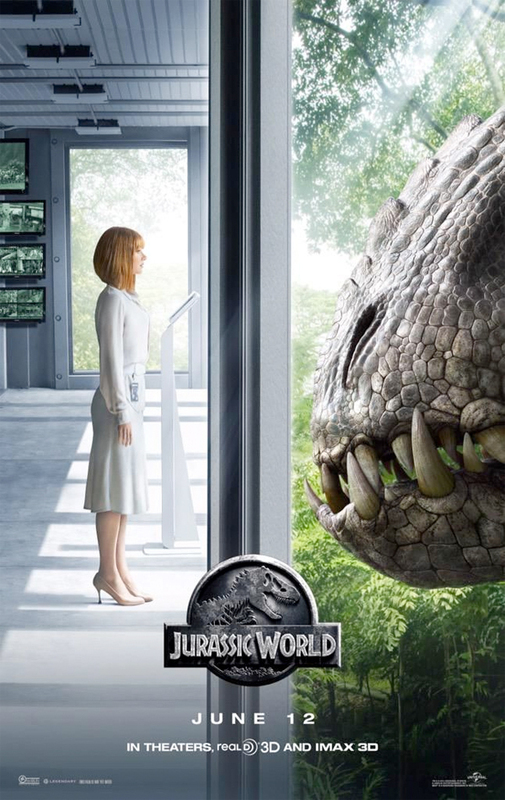 And leading up to the release of the new trailer, three new posters will be making their way online, and the first has Bryce Dallas Howard facing off with the Indominus Rex. Update! We've now added the two other posters, so here's all three before the latest trailer arrives. And here's the next poster - with that dang shark again. The quote: "We've made living biological attractions so astounding that they'll capture the imagination of the entire planet." Also debuted on Twitter. 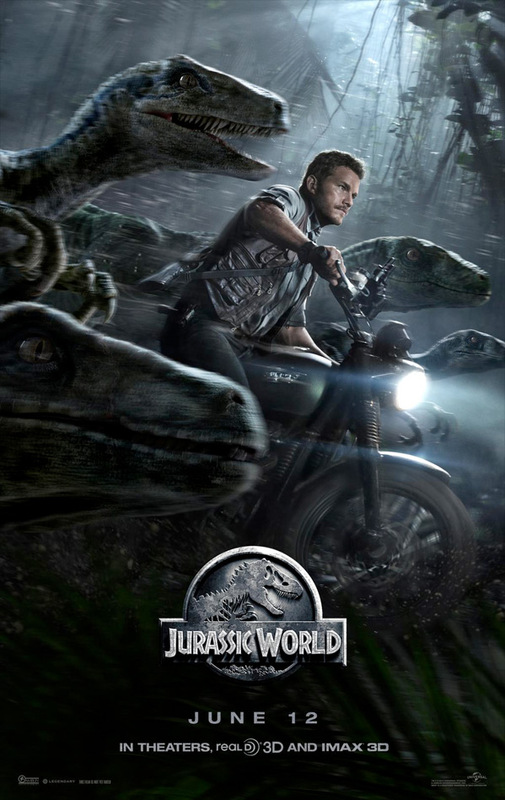 Finally the last one, with raptors and Chris Pratt. Awesome. The quote: "Fifty, sixty miles an hour if they ever got out into the open, and they're astonishing jumpers…" Also debuted on Twitter. While you're at it, you can still catch the very first trailer for Colin Trevorrow's Jurassic World right here. The most intense staring contest in the history. *Indominus rex. // Oh Gerd...my expectations are starting to sharply decline for JURASSIC WORLD. Yeah, that ridiculous dino name actually makes me realize me how little this has in common with the Jurassic Park we love... In the first and second movies there was still some semblance of a fascination for what the real bygone era of dinosaurs was like, but now with fake dinos that are "bigger and more dangerous" than real dinosaurs already were (and raptors you can train) it's starting to look like a generic Transformers-type of affair. The movie could be about 'Big Carnivorous Monsterbeasts World' and nothing would be different. Wow, all of that came to me just bc of that stupid name. Wow, that's the stupidest opinion I've heard on this movie so far. I swear, I think "she" looks awfully familiar……. oh, yeah……. Before you start spelling doom and gloom about the name of a dinosaur... think on this... in the books, they had dinosaurs that could cloak.... so stop feigning your lofty vision of disaster and just for once, could you people give the movie a chance and tell the truth online. Too many people read these sites, and read peoples comments that slam a movie just to be trendy, and cause great movies to suffer in the box office and deny us some well deserved sequels. I am looking forward to the Jurassic World, and I am not abashed to say it. Too many good posters in 2015. Creation is an act of sheer will... next time it'll be flawless. Citizen Kane this will not be. But gimme some popcorn and some gummy worms and I'm in . Uhh, I'm pretty sure the FIRST Jurassic Park was it's own-damn Movie, anyway.